As a thoughtful observer of the world around him, Brendan McGorry is fascinated by human-made systems and he scrutinises these structures through his multifaceted art practice incorporating drawing, painting, sculpture, and installation. some elusive satisfaction. We are randomly born – into privilege, into poverty, into the in-between – and chance may or may not alter our fortunes. McGorry reminds us that twists of fate can occur at any time. are transported to a dimension where we can explore human psychological decline – where celebrated art represents a pinnacle in human development – and the incoherent ramblings of the internal drawings seek to bring order, and deliberately fail. 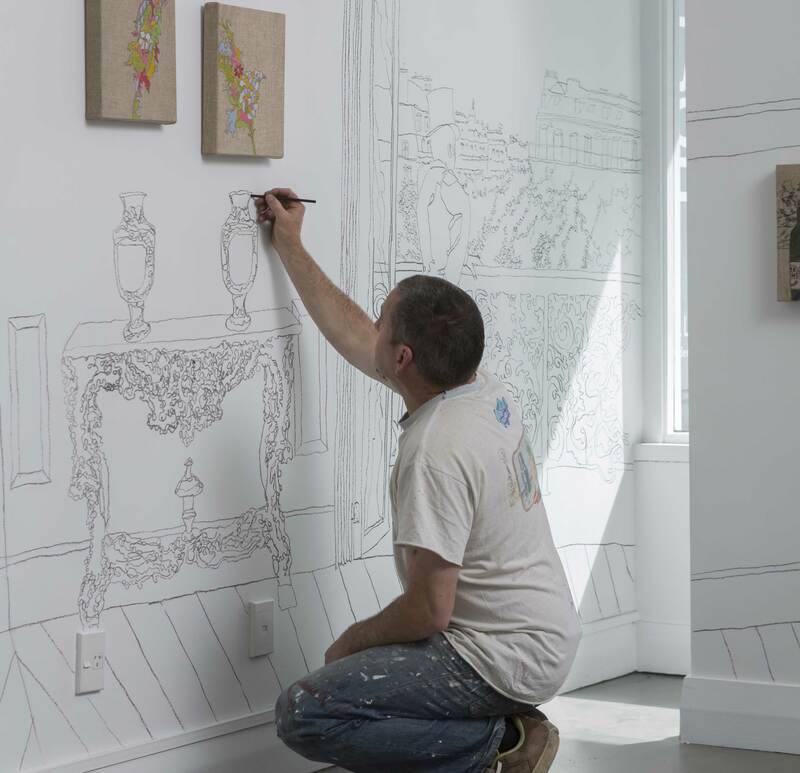 The Belle Époque Project from 2014 is an expansive mural drawn in free- hand line directly on the wall. It details a nineteenth century French interior complete with ornate furniture, vases and Parisian cityscapes through open windows. Within the mural, McGorry’s paintings hang in a strange trompe l’oeil-like situation. It’s not as if we are fooled by this as a ‘trick of the eye’, but we are at once aware of both the white-walled gallery we stand in, and the illustrated suggestion of this co-existent space. 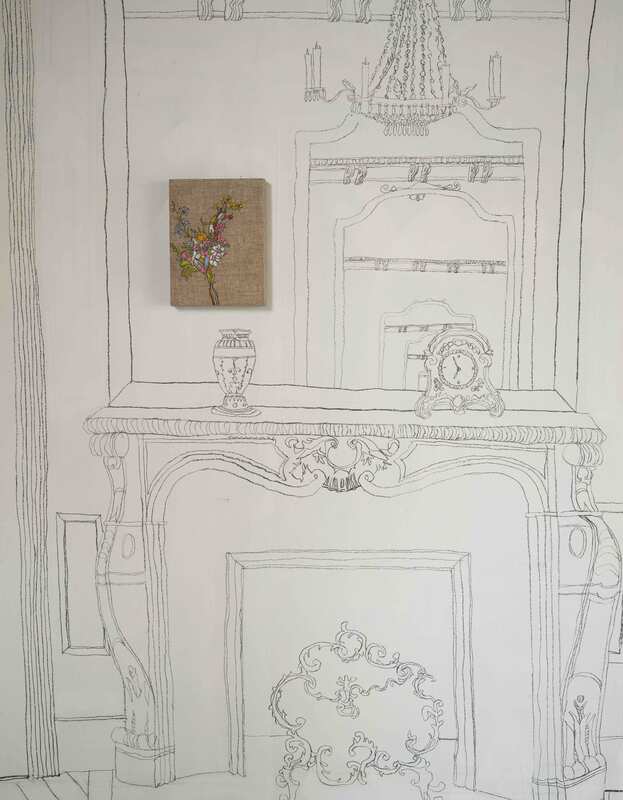 Individual paintings that populate The Belle Époque wall drawing are McGorry’s take on works by the masters of French Impressionism – Manet, Caillebotte, and Renoir to drop names. 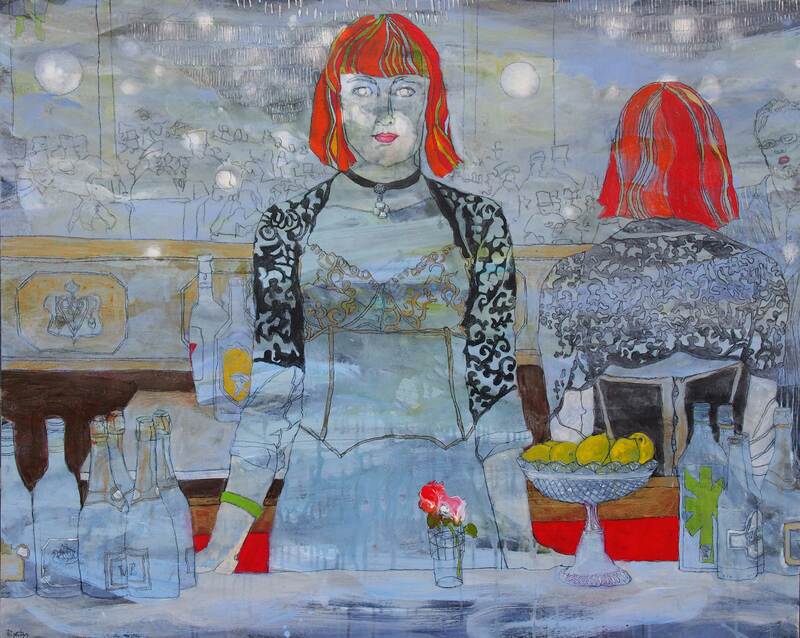 One such painting is Frances at the Folies Bergère (2014) a riff on Manet’s Un bar aux Folies Bergère (1882), famous for its deceptive composition of a barmaid standing slightly askew to the mirror behind her. These new interpretations of iconic paintings have an energy akin to the style of Egon Schiele, with the hand of the artist apparent in every wavering line. Washes and drips of acrylic colour build up the surface beneath the charcoal drawing. The blocked-in colour of accented elements enliven McGorry’s compositions – the vibrant red and orange of Frances’ hair bounces around with the highlights of yellow lemons, and the greens of a bangle, bottle, and the tiny shoes of the trapeze artist. 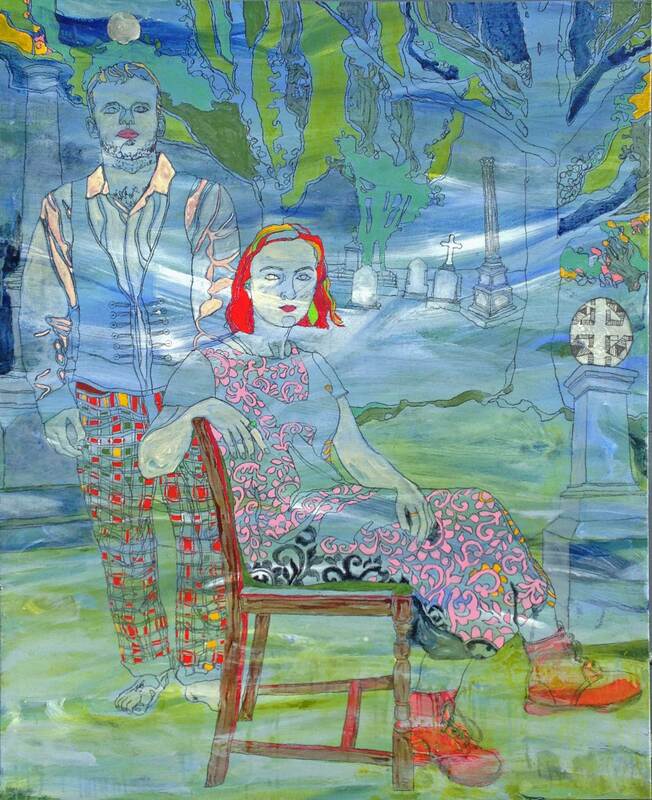 Likewise, pops of red and pink punctuate the cool watery blues in Another Day Another Galette (2014). McGorry uses our knowledge of art history as a device for social commentary. His work seems to question whether human kind continues to evolve on a positive course. Have we passed our peak of intellectual growth and are we now devolving? McGorry asks us to consider, on a personal level, our time and place in social evolution. Are we good people? Are we merely aging as opposed to becoming enlightened? In looking at his work, we may be contented to celebrate the history of art and have it echoed back to us, but perhaps we should be wondering if McGorry is asking us ‘why’ as he holds a mirror up to humanity.